For hundreds of years, the quinceañera has been an important tradition in every young Latin girl’s life. A time to begin the transition from her youth to adulthood, this joyous occasion is usually celebrated with a traditional mass followed by a beautiful party. You’ve most likely been dreaming of your big day for years, imagining the dress you’ll wear and the wonderful celebration you’ll have. In addition to celebrating your new freedoms and responsibilities, your quinceañera is a great chance to show off your original personality and tastes. With a little planning and a few creative twists on tradition, you can make your quince as unique as you are. We’ll give you some ideas to help show you how. Tea party. This theme is fun because you can go for a traditional “afternoon tea” theme or use a “Mad Hatter tea party” theme from Alice in Wonderland. Send out beautiful tea party invitations. Decorate the tables with tea pot centerpieces, accentuating with either flowers and pearls or mismatches tea cups and tiny hats. Choose a floral dress or a pretty strapless tea length dress. Serve delicious mini sandwiches and finger foods to your guests. Wizard of Oz. Take your quince guests to the Emerald City with an Oz themed party! Choose emerald green dresses for your damas and sparkling ruby red shoes for yourself. Create a yellow brick road leading to the party, and decorate those tables with creative Wizard of Oz-themed centerpieces. Lollipops would make perfect party favors for this theme. Around the World. If you dream of becoming a world traveler, an Around the World party theme will be perfect for your quince. You can name each table after a major city and decorate it appropriately, serve food from around the world and play a variety of music from different countries. Send your guests passport-style invitations and send them home with candy in small suitcase party favor boxes. Booklet invitations. Provide your guests with a timeline of your life, details of your party and plenty of photographs with booklet-style invitations. These detailed booklet invitations make excellent keepsakes that will be saved by your friends and family. Scroll Invitations. Announce your big day like royalty with beautiful scroll invitations. Complete with wooly paper for the scroll, golden bars for framing and matching envelopes, these invitations are perfect for a princess party. Magnet invitations. If you are building a quinceañera website with all of your party details, your invitations themselves can be quite simple. Using magnet invitations is not only original, it will ensure your guests will never misplace their invitations. 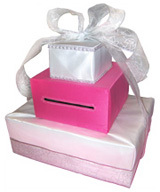 And don’t forget, your quinceañera invitations don’t have to break the bank! There are plenty of sites offering beautiful and affordable invitations for your big day. Remember, in addition to celebrating your transition into womanhood, your quince is a party to celebrate your individuality, so get creative with your party planning.